A fine pairing of World War II quickies. I have many guilty pleasures when it comes to film. Cliffhanger serials, Italian horror movies, European spy flicks -- I love 'em all. And, apart from kicking back at the end of the day to shut my brain off to a vintage b-grade western, one of my favorite ways to idly stare at the TV for hours on end is to watch a classic war film. Not so much the big-budgeted color spectacles with famous faces and runtimes the length of the California coast line, though. No, sir: I like my war films to be low-budget, black and white, short, and sporting a cast of people that make me go "Oh, hey, it's that one guy" or "Where in the world did they dig up that clown?" VCI's WWII Double Feature contains two seldom-seen low-budget gems that were right up my alley. The first film, Jungle Patrol, is a well-acted quickie from 1948 that focuses on the men (and one visiting woman) who inhabit a remote island airfield in the Southern Pacific. And the reason it's so well acted is that all of the action takes place off-screen. When the pilots are in the air, shooting at Japanese fighters, we're listening to them battle below; it's almost like a radio show come to life in that respect, which is attributable to the film's low budget. The movie stars several actors who were either complete unknowns at the time, such as Richard Jaeckel, Arthur Franz, and Harry Lauter; familiar faces like Tommy Noonan and G. Pat Collins; future TV writer/producer/director Gene Reynolds; as well as Mickey Knox, who would later become a cult fave by appearing in several Italian horror films. The bottom half of this double bill from the bottom rung of budgetary film fare is Silent Raiders (1954), a rather rough excursion that was made by a pair of bit part actors (Richard Bartlett and Earle Lyon) who gathered up a whopping $27,000 to make this one. And, while its limited funding is inherent in every frame, it's also what adds to the gritty realism here. The story involves a small unit sent in to destroy a Nazi communications center shortly before the Invasion of Normandy. A surprisingly atmospheric flick (there are some nice scenes of our heroes -- led by our writer/producer/director team -- wading through water surrounded by the dark, perilous night; there's also creepy theme song by Lyon) that probably inspired later "suicide mission" WWII films like The Dirty Dozen. The film also boasts an early score by the great Elmer Bernstein. Both features are from the Kit Parker library, and are presented in their original theatrical aspect ratios of 1.37:1 with mono sound. While time has not been kind to some of the materials here, that shouldn't prevent you from enjoying these two forgotten war flicks. And, should this double feature not be on-par with your sense of enjoyment as it is mine, and you crave something more realistic, VCI Entertainment has thrown in nearly an hour-and-a-half worth of vintage World War II footage culled from the Combat Bulletin archives. The series was originally filmed by the U.S. Army Signal Corps for the troops, and is shown here in two parts (European and Pacific). There's a lot of fascinating historical material here, and it's great to see this footage included with this double feature of enjoyable b-grade movies. 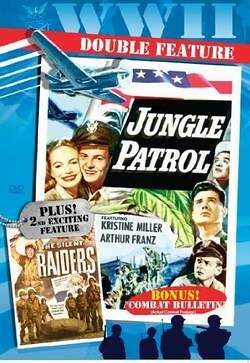 All in all, VCI's WWII Double Feature: Jungle Patrol / Silent Raiders is a great pick. It has everything I love in a classic war film -- and the acting was fine enough all-around that I never had to ask "Where in the world did they dig up that clown?"